We got given four Muscovy drakes. I was excited by the concept of yummy Christmas dinner and even though I had to drive home with them hissing like demons, in a precarious container, in the dark, I was happy to receive them. I didn’t realise how Halloween specific they looked until I saw them up close. They were huge, and irridecent black and white, with a warty red bill. They spent the night in the car and in the morning, the Husband and I carried them up into the electric fence enclosure. When I let them out, they all stayed together and didn’t mingle at all with the other ducks. However I did not do my research. That evening when I went out for the night feed and to get all stragglers back into the pen (I have the chickens from Chicken Run), the four Muscovy took one look at me and flew straight up! For those who don’t know, Friendly Cove is a large Georgian style house. 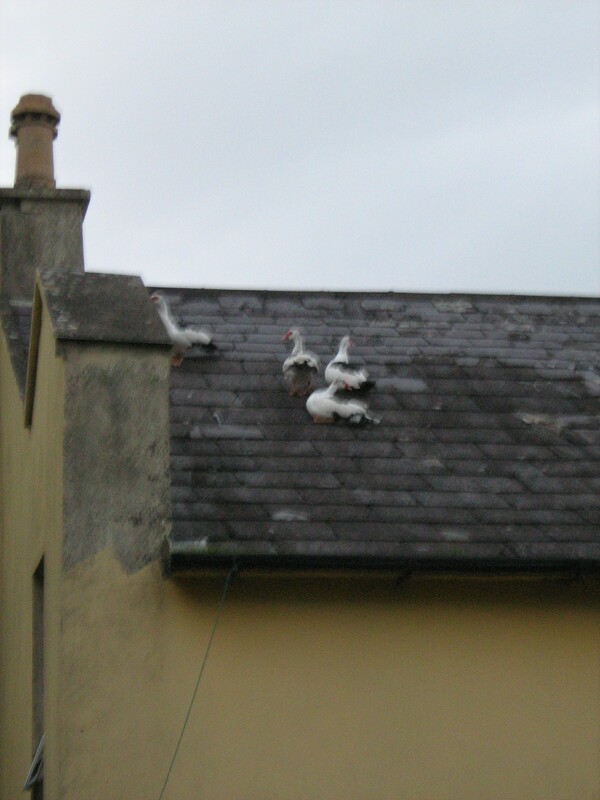 When the Muscovy took off, they flew onto the roof. As they waddled up the roof to position themselves, one by one they kept sliding down, often taking another with them on their way down. There they were about 35 feet in the air teetering on a narrow gutter. Only once they hit the gutter would they have a little fly up the roof again, where after 30 seconds their weight would send them sliding down again. After a half an hour of this fun, they decided to settle on the flat section. We don’t have a ladder that will reach up that far, so the decision was made to leave them there, and that they would probably head down themselves for feeding the next day. They stayed up there all day, and through the next night. At this point, Christmas dinner seemed unlikely without a ladder purchase. During that next day however, they came down and single filed down to the pier where they launched themselves into the estuary. We see them every day since, blending in with the seagulls. I am in hiding due to releasing large Muscovy Drakes into the local ecosystem. The Husband is fully confident that his trapping skills are up to the challenge. However, to date, there has been no recapture! This entry was posted in ducks, Family, Gardening, West Cork and tagged dinner, ducks, escape, friendly cove, muscovy. Bookmark the permalink. Oh my god! There is never a dull moment is there?! !